Sonos Amp review | What Hi-Fi? Having focused on wireless speakers for the past few years, Sonos has returned to its roots with its latest product: the Sonos Amp. Like the ZonePlayer 100 and Connect:Amp (previously known as the ZP120) before it, the new Sonos Amp is designed to offer all of Sonos’s streaming smarts in a unit you can add any hi-fi speakers to. In fact, the Sonos Amp goes further, offering a number of features from the Sonos Beam, making it surprisingly well suited to movie as well as music use. Certainly, if you want the best-sounding and most feature-laden Sonos available, this is it; but the Sonos Amp also has a different set of expectations and rivals to its siblings, and that makes things a little more complicated. Sonos’s Patrick ‘PG’ Gall describes the new Amp as “the Connect:Amp on steroids”, but he’s talking about its under-the-skin muscle rather than outward appearance, because the new amp is arguably the more svelte of the two. In fact, by volume, the Amp is marginally smaller than the older model. Its dimensions are markedly different, though, as this is a shorter, deeper and slightly wider device. 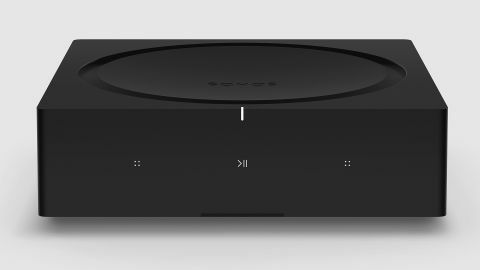 The new shape is the result of conversations Sonos has had with custom installers, who have long used the Connect:Amp in customer set-ups, despite that never having been its intended use. This time, Sonos has set out to make a product that will better serve custom installers’ needs. These new dimensions make the Amp better suited to placement in a hi-fi rack and easier to hide out of sight. It’s also stackable: Amps can be placed on top of one another in a central location, with speaker cables running to various rooms in the house. That’s the kind of thing that can work really well in custom installations. Even by Sonos's standards, this is an understated device. It's only available in black and has only three touch-sensitive ‘buttons’ on the front: one for play/pause and two that change use with context but are mainly for increasing or decreasing the volume. The insides of the new Amp are densely packed, with no dead space. That, of course, creates a cooling problem, but the Amp is designed to bring in air from underneath and expel it from the top, all without the use of a fan. Around the back of the Amp you’ll find all of the connections of the Connect:Amp – two pairs of speaker terminals, a subwoofer output, two ethernet sockets, and a stereo analogue input. But there’s one important addition: an HDMI socket. That HDMI socket gives the Amp all of the TV-partnering features of the Sonos Beam, including automatic switching to TV audio when required and volume control via your TV’s original remote. As with the Beam, the Amp is intended for use in simple systems with few video sources, all of which are plugged directly into the TV and have their audio piped back out to the sound system via ARC. That might make it restrictive for serious home cinema users, but for the intended audience it makes for a simple, seamless setup. We had everything up and running perfectly in minutes. As with the Beam, Playbar and Playbase, two Sonos speakers (such as Ones) can be used as surround channels with the Amp, or you can instead add a second Amp connected to any two extra speakers you like to create a 4.0 system – or even 4.1 if you add a wired subwoofer or the wireless Sonos Sub. There’s no way to create a 5.1 system, though, as there’s no output for a centre channel. Sonos says that isn't an issue as it creates a phantom centre channel through careful, precise processing. The Amp can alternatively be set to output in dual-mono so that it sends the same sound to both speakers, which can be useful if you’re using ceiling or even outdoor speakers with which you’re not intending to create a stereo image. Sonos has partnered with Sonance to create the Sonos Architectural by Sonance range of speakers, which includes an in-wall speaker, in-ceiling speaker and an outdoor speaker. These are not Sonos speakers in the usual sense, but passive speakers designed to complement Sonos products in terms of finish and sonic character. If you connect the Amp to a pair of Sonance speakers, you can use the Trueplay feature to tune the sound to your room. With other speakers this isn’t possible. Otherwise, though, the Amp is designed to be more flexible than the Connect:Amp when it comes to powering third-party speakers, most notably in the increase in power from 55W to 125W. This makes it far more capable of powering bigger, more demanding speakers. Of course, the Amp also has all of the music streaming skills of every other Sonos device, so gives you access to music from practically every service under the Sun, and allows you to combine it with your own digitally stored tunes in on-the-go queues. If, though, you’d hoped that this refreshed embracing of hi-fi might bring with it support for hi-res music, you’re going to be disappointed: Sonos is sticking to its established stance on hi-res, which essentially boils down to it being more trouble than it’s worth. CD-quality continues to be the upper limit for Sonos, at least for now. The Sonos app remains vastly superior to that of any of its rivals and an excellent way to control products, including the Amp, but the company is also taking strides towards making the system increasingly hands-free. The Amp doesn’t have an in-built microphone, but it will respond to voice commands issued to Amazon Alexa- and Siri-powered devices, including, naturally, the Sonos One and Beam. AirPlay 2 is on board, too. Sonos has also introduced the option to switch wi-fi off across all of the company’s devices, including the Amp. For many people there’s no reason to do this, but for those who favour a faster, more robust wired connection and would like to eliminate a potential source of wi-fi interference, this should be quite exciting. Sonos’s claim that the new Amp is capable of driving a greater variety of speakers largely holds true as we switch between a selection of our favourites, from the budget Elac B5.2 standmounters to the Monitor Audio Silver 200 floorstanders. Even the combination of the amp and our £7k reference ATC SCM50s doesn’t sound like an extreme sonic mismatch. That said, you will obviously get more out of a premium pair of speakers by powering them using a more premium amp, and the Sonos Amp makes the most sense with quality speakers more toward the budget end of the spectrum. The aforementioned Elac B5.2s are a good choice, or, if you can stretch the budget a bit, the diminutive B&W 607 standmounters or Fyne Audio F302 floostanders. Once you’ve connected your chosen speakers to the Amp, it’s worth delving into the EQ menu in the settings and experimenting with the Loudness feature, which is switched on by default. It makes a far less pronounced difference here than it does on Sonos’s wireless speakers, but we do find that with Loudness switched off the Amp has just a little more organic roundedness to its delivery, particularly in vocals. You may find, though, that in your room or with your specific speakers, Loudness produces the preferable performance. Kicking off with Prefab Sprout’s The King of Rock ‘n’ Roll, we discover a soundstage with a lovely blend of width and focus. All of the intended fun is conveyed thanks to the precise placement of the seemingly incongruous effects – the plane whooshes from far-left to right, the vocal has that lovely, airy, disembodied quality to it and is flanked by those silly, trumpet-like parps from the keyboard. It’s an impressive presentation, spatially speaking, and it’s this quality more than anything else that makes it well suited to home cinema use. Play Star Trek: Discovery on Netflix and the broad, three-dimensional soundstage fills the room with atmosphere while individual sound effects have exciting focus. The ‘phantom centre channel’ works well, with dialogue proving clearer and more direct than in a typical stereo system. A dedicated centre speaker is predictably better in this regard, but Sonos has done an admirable job of creating the impression of one without the extra hassle or expense. The ability to add surround speakers to the Amp is very appealing, but it is worth mentioning that it’s highly unlikely your chosen front speakers will blend seamlessly with the surrounds, and that can make for a slightly disjointed surround field. Better would be to add a second Amp and a second pair of the speakers you’re using at the front, but that would be an extravagant outlay for a home cinema system with limited inputs and surround format support (Dolby Digital 5.1 is the Amp’s limit). Back to music and we play Alt-J’s Every Other Freckle, yet again enjoying the spaciousness on offer and revelling in the expertly painted tonal picture, which balances substantial bass with textured mids and glistening treble that refuses to brighten. It’s an immediate, upfront delivery that’s instantly engaging and exciting. There’s oodles of punch here, but the Amp skilfully avoids ever veering into jarring hardness or irritating harshness, and there’s decent detail behind the initial hit of each note. But the Amp does, when compared to streaming components of a similar price (and non-streaming amps at lower prices), lack the real hi-fi-like subtlety that comes from low-level dynamic delicacy. It’s a bold, attention-grabbing delivery, but one that struggles a little to peel back the layers towards the centre of a track and get to its emotional core. Combined with a less than regimental sense of timing, it equates to a performance that, while not entirely bereft of rhythm, doesn’t quite capture impetus or certain tracks’ ebb and flow. Organisation can become a slight issue, too, with the relatively complex arrangements in the choruses of both Every Other Freckle and SBTRKT’s Trials of the Past proving a challenge too far, with specific instruments getting a little lost in the melange. Again, the broad strokes are there and the Amp provides an enjoyable listen, but it doesn’t quite offer the kind of expressiveness or insight that rewards really attentive, contemplative listening. If you’re already eyeing up a Playbar or Playbase, we urge you to consider spending the extra on the Amp and a capable pair of speakers. As mentioned, we’d suggest the B&W 607s if you’re going small or the Fyne F302s if you’re going big, either of which will take your total system cost to £1000. That might seem extravagant compared to one of Sonos’ £699 dedicated TV speakers, but not only will you have a far more hi-fi like sound system, it will actually perform better with your TV, in terms of both sound and useability. And let’s remember that Sonos as a whole is still way ahead of the pack when it comes to streaming features. No rival supports more streaming services, is easier to use or has a more polished app, and these things matter when you’re living with a product, potentially in every room of your house. But the serious sonic ambitions of the Amp provoke serious sonic comparisons, and it’s impossible to deny that while this just-add-speakers streaming system delivers room-filling, party-rocking fun, it also lacks just a little subtlety and sophistication, particularly when compared to the (admittedly more expensive) Bluesound Powernode 2i. That said, there are lots of reasons you might choose Sonos over Bluesound as a system, and if you’re firmly in the Sonos camp and you like the sound of what the Amp does, you will almost certainly like the Amp in your lounge.